“Something old, something new, something barrowed, something blue." To make sure the bride-to-be is drying her tears away at her ceremony in style, get her a Personalized Bridal Hanky. You can make sure that your wedding will be perfect by personalizing your own hanky. 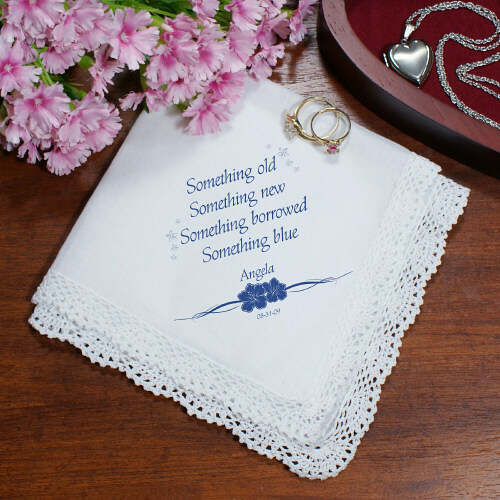 Our Personalized Something Blue Ladies Hankies are available on our 13" square Crochet Lace handkerchief. Soft to the touch. Machine Washable. Includes FREE Personalization! Personalize your Wedding Handkerchief with the bride's name and wedding date. This is really pretty and sweet for my daughter in law to be! I know she will just love it! This item is just as is shown on the site (with my personalized information of course)! Even though it was personalized it came within 3-4 days of my order! We carry an wonderful selection of Personalized Wedding Gifts & Personalized Bridesmaid Gifts. GiftsForYouNow.com can provide your entire wedding party with attractive Personalized Bridal Party Gifts.